You have selected the 1 Year Print Only membership- OUTSIDE USA membership level. 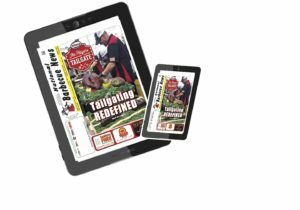 The Original Barbecue Magazine that is published each month with info related to ALL Things about barbecue. 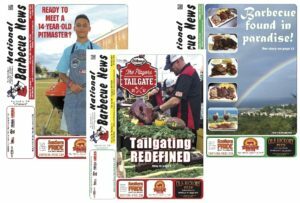 Backyard section with new barbecue recipes, the latest bbq cook book reviews and product reviews. Competition section with an up to date barbecue events calendar, selected event photos and articles and more. Business section with monthly updates from several different barbecue associations, a barbecue restaurant guide from places we recommend and different stories about bbq business related news. We also feature advertising from all kinds of companies from bbq pit and grill manufacturers, bbq rub and sauce producers, barbecue accessories and much more. Printed edition is delivered each month by the US Postal Service to your address. You will enjoy access to all of the information contained in our monthly printed edition (details found above) but formatted in a way that replicates our website pages and easy to read on any digital device. Each issue has a table of contents and you can simply click on the info that you want to read and you will be directed to that page immediately. You will also gain access to back issues that will start with the MARCH 2017 issue.